By sabine, June 17, 2005 at 9:12 am . Why Land and Why Cities? Big bucks, Big policy efforts, Big systems, and new laws and illegalities. Although it is seductive, we need to move beyond the Marginality thesis to consider forms of contestation and it’s varied politics. The film which was shown, showcased Bangalore in its different economies and city contexts. For all economies location is critical… the economies require little land and infrastructure. There is a bureaucratic regime behind securing the land. Neighbourhoods in peripheral settings provide possibilities for small and medium enterprises. Large developers easily take over the lands. There is a sort of Master Plan taking place. The replacement of this older forms of land tenure allowed large players to take over the land. The eGov Foundation.  There is an imagery of a modernisation in contrast to the older ‘non – transparent’ forms. It would make village counsellors to be less corrupt, but there was not less corruption thanks to this modernisation. It brings new high and super high end players to play the “cyber speculation game”. Benjamin talked about the structure of how papers are filled out and how this is controlled by the system. The papers that are referring tot the titles are becoming trading goods. 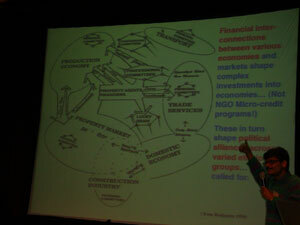 So, we should move beyond the ‘global’ and ‘marginalized’ dichotomy but look at land redistribution in city contexts. There we can see complex structures of economy etc emerging. E-governance has to be seen in a larger process of economic, institutional city based politics. Most urban employment does not come from master plan settings. Financial interconnections between different economic processes. Incremental capitalization of the land funds the local economy. Perhaps more important, a specific focus on flexible property regimes that allows for multiple tenure. These shape the distribution of land market surpluses within networked firms: “flexible” land and local economies. Corporate economies feed on singular tenure emerging from master planning. The Master Planning is made possible by big boys who talk at night. Land is becoming not more then just cybertitles: you can own a piece of land without having to show actual occupancy. Based on titles (thanks to e-governance).